Das Fremde | | Sony Computer Science Laboratories, Inc.
Das Fremde is an installation based on years of research at Sony Computer Science Laboratories, Inc. on the evolution of language using robots. Many experiments have been done at CSL in the last decade on the evolution of names (Loetzsch et al., 2016), spatial language (Spranger 2012, 2013, 2016), color terms (Bleys et al., 2009), action and event language (Steels et al., 2012) but also aspects of syntax such as Aktionsarten and aspect (Gerasymova et al., 2012), and determiners (Pauw & Hilferty, 2012), just to name a few. These studies have shown in detail the relationship of embodiment (Loetzsch & Spranger, 2011), conceptualization (Spranger et al., 2010) and social environment (Baroncchelli et al., 2010) in constituting driving factors for the development of language as a tool for communication. Das Fremde is a tribe of artificially intelligent robots who invent their own language and culture in real-time. 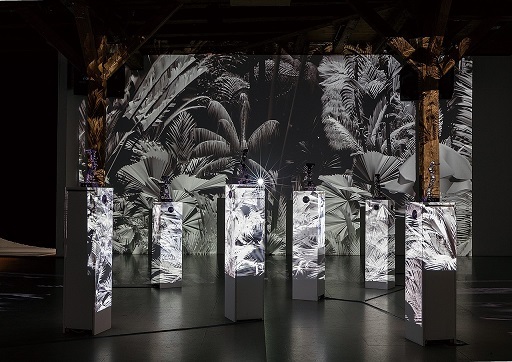 The development of this micro-culture is influenced by their interaction with the environment and, in particular, the visitors of the installation. The installation focusses on the construction of cultural identity by creating an experience of encounter with a radically foreign culture—but one that is a human creation in itself. 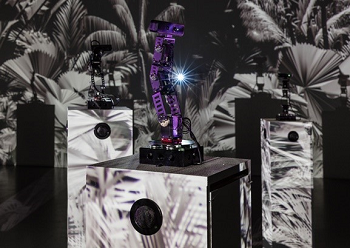 Das Fremde questions our interaction with machines in the age of artificial intelligence and gives robots and humans a chance to share time and space for a moment of reflection and poetry. Can we have empathy with these beings? How does the robot culture react to the human intruders? Is this artificial culture really different from ours? What is our relationship with machines and - maybe more importantly and often omitted - what is their relationship with us? Das Fremde reflects the most advanced discussions about artificial intelligence and cultural identity currently raging in society and the scientific community. It contributes to these discussions with an artistic approach that reveals the processes involved in the construction of cultural identity in machines and humans.